Hello Fellow Teachers out in internet land! I have been on spring break this week and had all sorts of intentions of writing a good half dozen posts. The week has flown by with daughters home to visit, many breakfast-lunch-coffees with friends, and my little, furry companion, Popeye, coming to the brink of death yet again (she turns 16 in three months, and in three months her diagnosis of kidney disease reaches the three year mark... she is the original Ever Ready Yorkie-Bunny who just keeps on going, even surpassing the life expectancy of a healthy Yorkie. She is right as rain again today, but these scares let me know the end is drawing near.) I should get on to classroom prep for the weeks ahead, but I'm going to shoot out a quick, photo packed post– hahahaha, they are never quick. 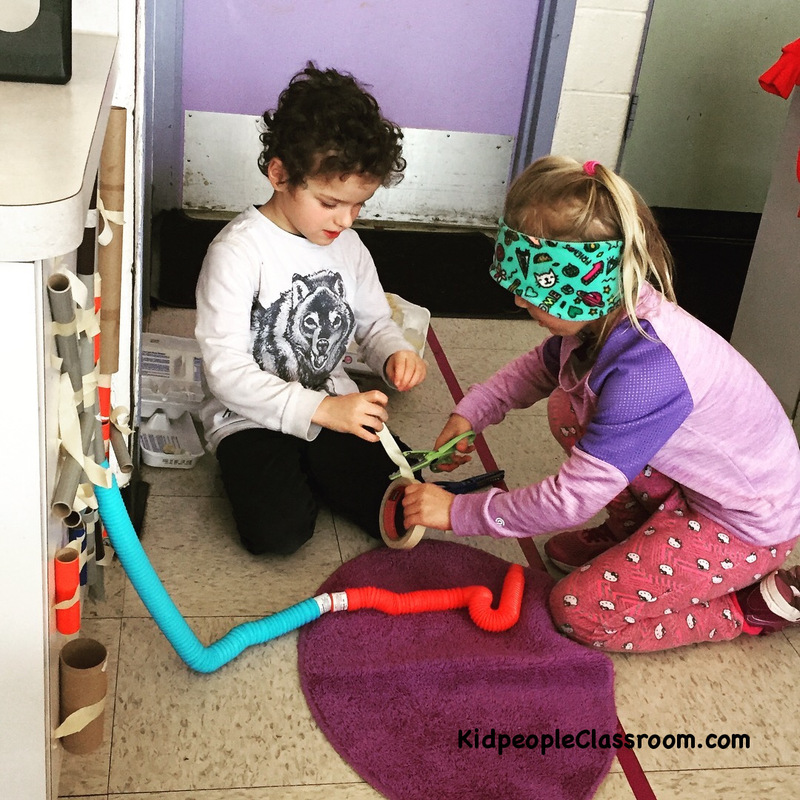 Hopefully you get an idea or two from seeing what we're up to in our kidpeople classroom. We made spring flowers. I gave each kiddo two, dollar store paper doilies. They used fat markers to put a lot of color on each doily. They then placed them on a tray and dripped water all over them- water droppers are such fun. Tipping the tray at different angles let the water ran over the doilies, making the marker ink run, too. Then they set them in a corner of the room to dry. The next day they cut out leaves that said Think Spring. I cut a few small pieces of green masking tape and let the kiddos attach their leaves to a green straw stem. I snipped a hole in their two doilies, slid both doilies down on their straw, and tightly twirled a piece of masking tape around the doily where it met the straw. Older kids could do this themselves but my guys needed help. 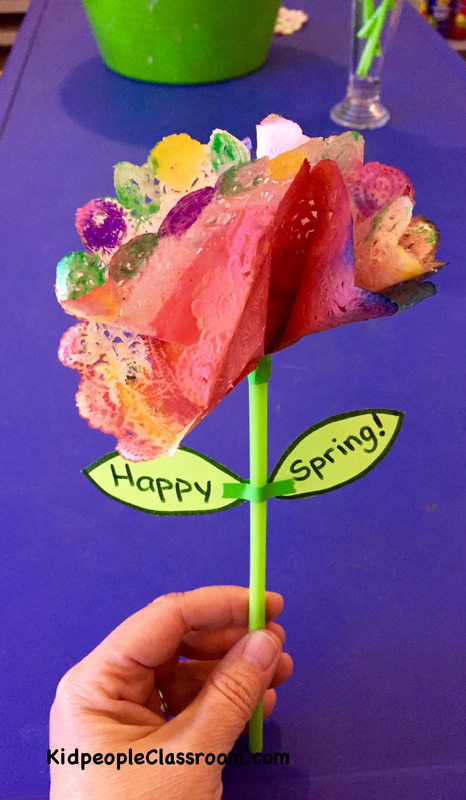 Voila– a spring flower to take home. 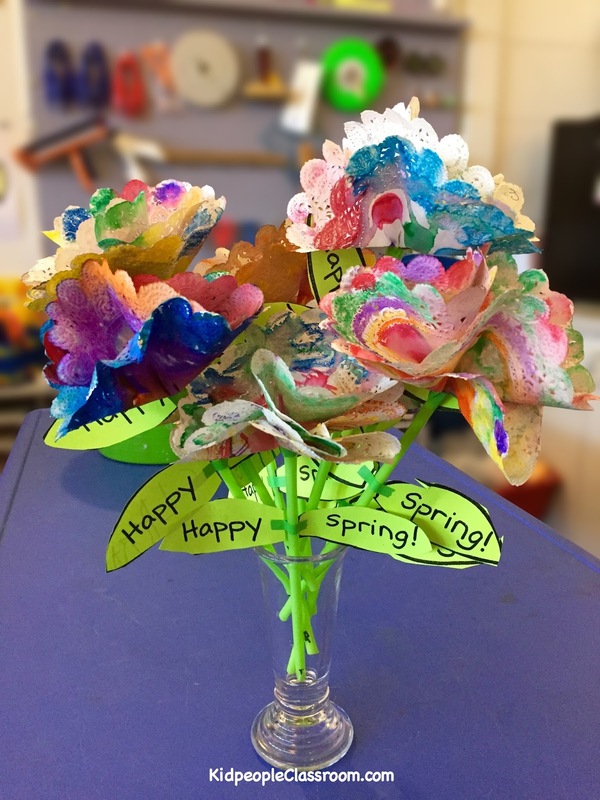 Could make a nice little Mother's Day craft, too. Some of the kiddos liked doing it so much they made some for me to keep in the classroom. Easy tie-dyed spring flower. Good for Mother's Day, too. Do you have a lot of those cheap plastic eggs around? I took a dozen, numbered them, and put tiny objects inside– a good purpose for all those little lost doodads that hang around in my pockets... like a Jingle Bell... good grief! The kiddos chose an egg, opened it up and wrote the object's name on the list. It was great practice for stretching words to hear sounds. It also turned out to be good small muscle practice because I told the kiddos they could not place the egg back on the tray unless the egg was snapped shut, and that was a challenge... a doable challenge, but not easy. The list paper is FREE on my TPT store– it's a very popular resource, having been downloaded over 3200 times. Click HERE get the freebie. 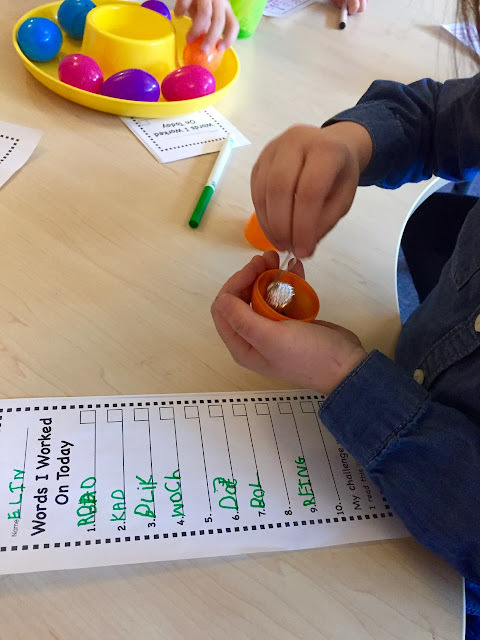 Little objects in eggs make it fun to sound out words. List paper is a freebie! You can get a little STEM milage out of those plastic eggs, too, if you let the kiddos experiment with stacking them. They tried stacking just the round bottoms, the pointy tops... do eggs have tops and bottoms– snort... and a mix of the two. They recorded their findings on a class graph. I won't tell you which shape won, but I will tell you there was a clear winner. 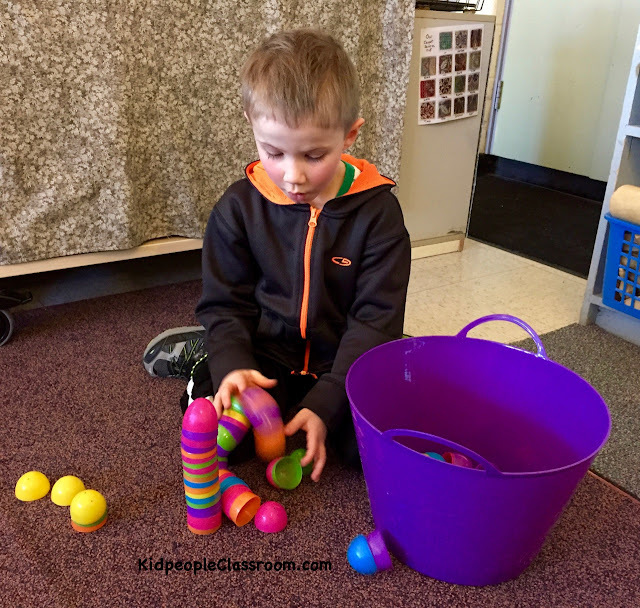 A little STEM egg fun. Which stacks best– round, pointy, or a mix? 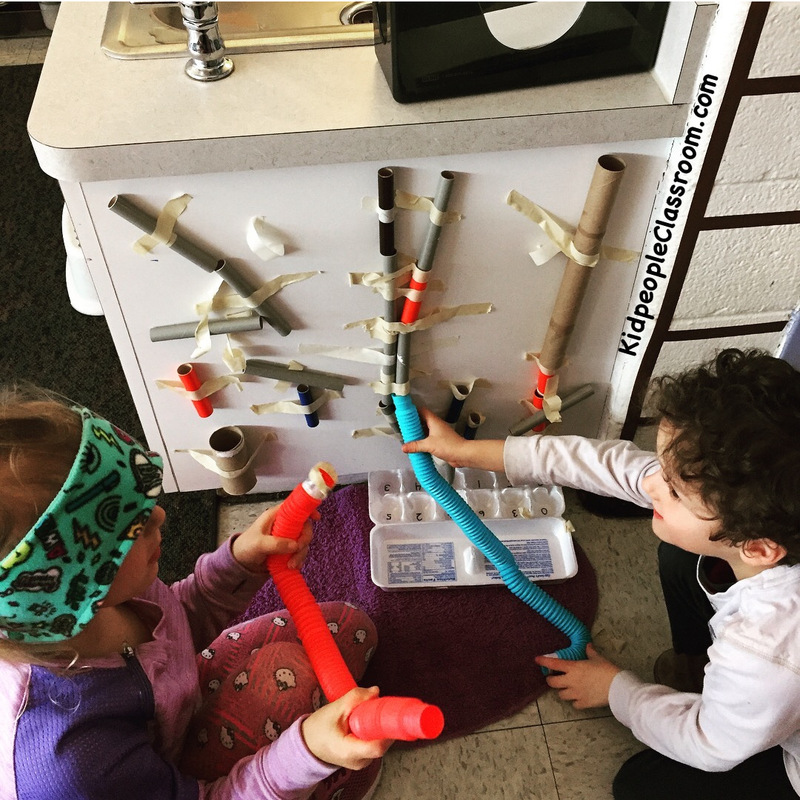 Here's another easy STEM idea– get all sorts of tubes from home, marbles and masking tape. This side of the sink counter was the only wall space left in the room that the kids could easily access. I left this STEM center up over several weeks and various kids had lots of turns. Quick, easy, and completely kid powered. 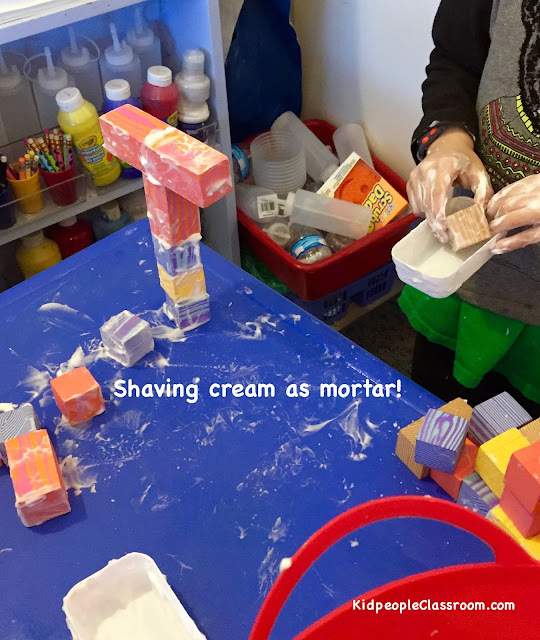 When is shaving cream not for shaving? When it is mortar! 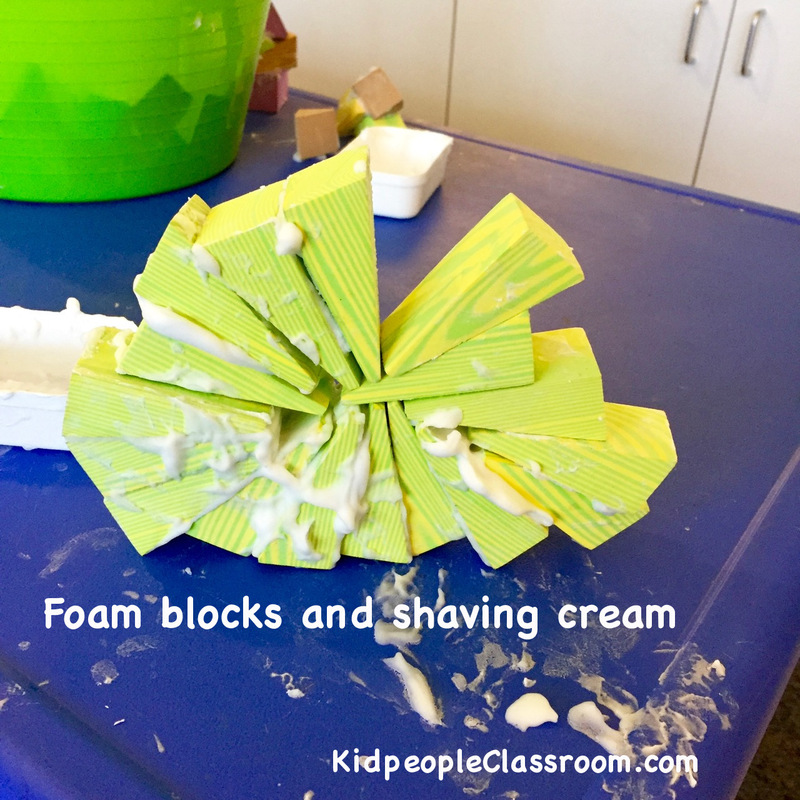 Yet one more STEM project came about when we used shaving cream with foam blocks. First cubes, and then triangular prisms for a bit more challenge. Good clean mess that smelled great and cleaned the blocks and table really well. I thought this was a lovely display. 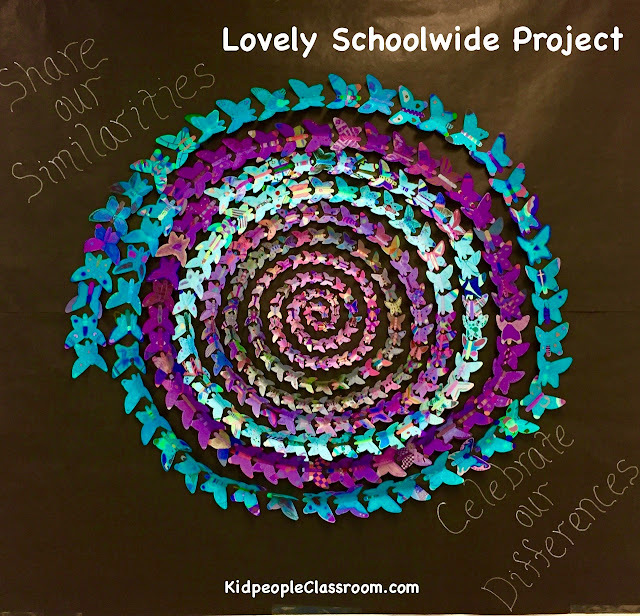 Our PTO and art teacher got together to bring this project to fruition. One parent used her Cricut to cut the butterflies out of card stock– the size of butterfly corresponded with the students' grade so my kidpeople are the tiny butterflies in the center. Our art teacher had students decorate with gel pens and, boy, is there some terrific detail when you look up close. Another couple parents did the layout. It's especially nice that the butterfly wings raise off the paper for a 3D effect. This large display went up just in time for our International Night. Love it! The photo doesn't do it justice but I thought it was an idea worth sharing. As I get ready to sign off, here is a little Easter treat for you. My April Showers resource is 50% OFF this Easter weekend, Saturday and Sunday only. 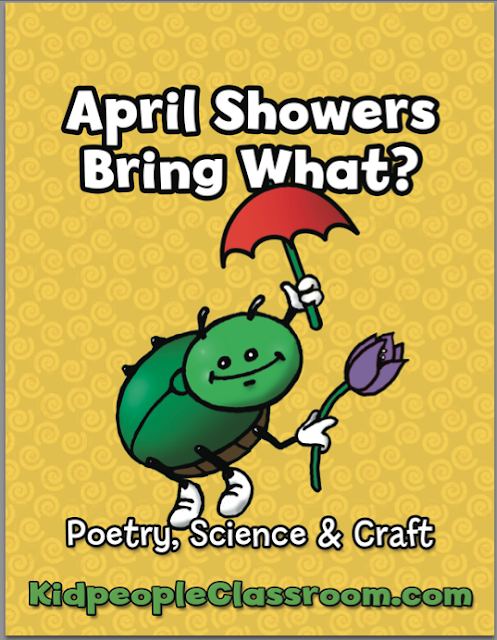 This cross curricular pack has a funny twist on an old saying, a craft, a close read on June Bugs, response sheets, and a pocket chart and bookmark version, which all adds up to lots of fun learning. And come on, for a buck fifty, it is a bargain. Skootch on over to TPT by clicking on the cover photo above. It will be a fun project for your kiddos in an upcoming April week. That's all for now, folks. If you'd do me the favor of Pinning photos, I'd sure appreciate it!